Raised by her father to be a deadly assassin Hanna believes she is ready for her first assignment. Once she is dispatched she must face how ready she really is for the life she was raised for. "Hanna" is a fairy tale cloaked in a action thriller. Children are often given false hopes or illusions that they dream of. They create expectations of what life should be like. Mainly based off what their parents have taught them, but also what they've allowed them to see. This movie takes those basic ideas and throws them into the upbringing of a assassin. Hanna (Saoirse Ronan) is trained from birth to be a highly skilled killer and once she decides to take on the role outside of her sheltered existence, she rapidly learns the results of her choice. From frame one the audience knows that Hanna is apart from other teenage girls. Introduced within in a arctic setting, a locale most would hate to endure, Hanna exhibits nothing but calmness and serenity. It is very clear that while this location may appear rugged and bitter, to our main character it is home and she is within a very protective state. This is the first aspect in "Hanna" that gives the action a lasting quality. Director Joe Wright and cinematographer Alwin H. Kuchler do a remarkable job of executing Hanna's emotional journey on screen. Without error what Hanna feels throughout the 111 minute thriller comes across on screen repeatedly. From the beginning you can feel safety personified through Hanna's father Erik (Eric Bana), the home they are living in and the steadily trained focus of Hanna. Hanna's father is restrictive and unforgiving with her, yet he is also filled with compassion and restraint. The opening to the thriller takes its time remaining very settled, but once Hanna decides she is ready for her pre-destined mission, the film takes a staggering turn and shifts through the varied range of radical emotions that Hanna experiences. Particularly, the early stages outside of her father's protection. Many of these scenes are quite jarring leaving a feeling of confusion as Hanna proceeds through her assignment. 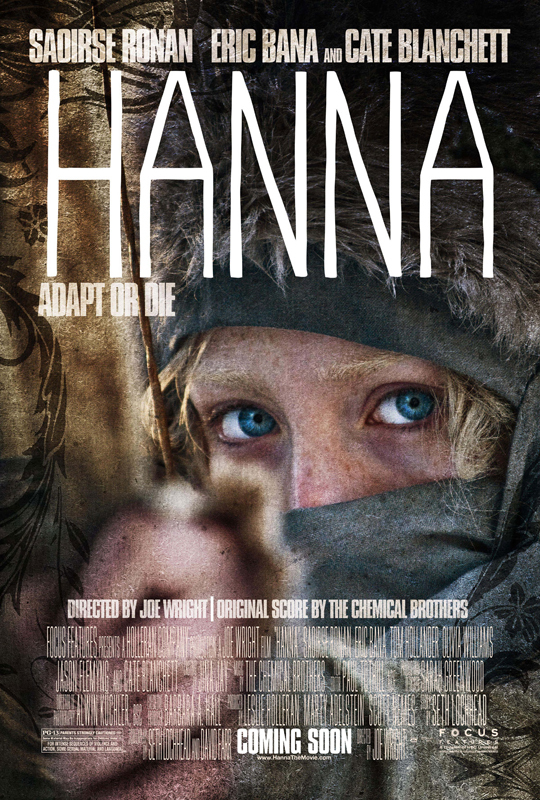 "Hanna" is an action-thriller however it houses so much more. It is also coming of age tale. Hanna has been programmed to kill but once she is set loose on her mission, she is learning on her own and outside of the watchful eye of her father. Hanna is introduced to foreign situations that breakdown the levelheaded and calculated exterior she carries for the majority of the film. The intriguing flip to this is the experiences that make Hanna lose her sterile composure are scenarios most people would deem trivial and mundane. Like hanging out with friends, listening to music and having normal conversations. Hanna is wide-eyed to all of these experiences taking them in and appreciating them for what each one is worth. Giving the audience a chance to see Hanna cherishing these mundane acts even as fleeting as they may be in the grand scheme of her mission pays off both in characterization but also in connecting with her character. Seth Lochhead and David Farr's script is also filled to the brim with fairy tale metaphors and references. Hanna's journey is comparable to a combination of Grimm Fairy Tales. There is a pre-destined path (one that has been foretold again and again), evil witches along with evil henchman (Tom Hollander), gingerbread houses, good samaritans (Jason Flemyng and Olivia Williams) and grandmas all involved as plot devices but much deeper there is Hanna's pre-conceived ideals of hope to the mission. In essence she is fighting towards a happily ever after scenario, one that may be uncatchable. At least in relation to the expectations Hanna has set in her mind. To his credit, director Joe Wright is able to deliver a white knuckle action that is filled with thrills but also brushed with real depth and human experiences. It almost felt necessary because Hanna, much to the credit of actress Saoirse Ronan, is so rigid and tempered throughout most of the film that giving her those moments to slow down and cherish normal human experience are what excel "Hanna" past they typical surface level action film. Everyone throughout "Hanna" is polished but two actresses carry this thriller. Saoirse Ronan is positively intoxicating as Hanna. Her piercing blue eyes combined with the bleached white hair will initially grab the audiences attention but it is Ronan's performance that keeps the arresting energy on display. Ronan does a remarkable job balancing between a trained assassin and a innocent child who has been sheltered her entire life. She only knows what she has been programmed to know and Saoirse Ronan nails every facet to the character of Hanna. Cate Blanchett is riveting in her performance. Blanchett plays Marissa, a CIA handler who was assigned to locate Hanna and her father Erik. Blanchett is pure villainy. She is the witch that Hanna must destroy. Blanchett comes across cold and matter of fact to her associates and vicious towards anyone obstructing her path to Hanna. Her journey towards Hanna is just as compelling as Hanna's journey towards Marissa much to the credit of Blanchett's hair-rising performance. 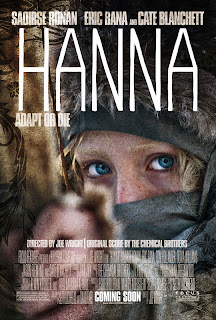 Better yet, the suspense built-up between the two characters really helps add another lasting element to "Hanna." "Hanna" is a charged experience. The film houses inspired performances and characterization but it too is jammed with stimulating action. Action that uses nice long takes that actually showcased the action sequences. This was a breath of fresh air. Single takes with one camera instead of fifteen different angles all chopped and edited together. Editor Paul Tothill who has worked with director Joe Wright on all his previous films seemed to remain steady and dedicated allowing a shot time to play out instead of over-editing it. The action itself isn't anything new at all, in fact I noticed a lot of influence from other genre based action films, but it is enthralling throughout. There is one action sequence in particular that fans of Park Chan-wook's "Oldboy" are sure to recognize. The scene tries to set itself apart while also clearly borrowing from what has come before it. Actress Saoirse Ronan deserves credit for her capabilities with the action throughout Hanna. While I'm sure her stunt double Maré Zaenker did a good chunk of the more dangerous scenes, its clear on screen, that Ronan did an impressive amount of the work herself. "Hanna" has incredible balance. It works as a simple suspense action. It works as fish out of water drama. It works as a fairy tale. It works as a espionage thriller. It works as a coming of age tale. It also works collaboratively between all of these various subplots. All of the various levels come together quite nicely and make a exhilarating cinematic experience. Finally it would be a sin to not make mention of The Chemical Brothers hypnotic score. The score energizes all the action while also having an enchanted and playful feel for the more fairy tale elements on display. A majority of the tracks are instantly burned into memory and music that would be hummed on a repeated basis. Most of all the music just pushes the already charged film along. There are a number of scenes where the The Chemical Brothers score kicks it up a notch to really add a level of intensity I didn't see coming from this film.